Dan Biggar started as a half-back partnership with Rhys Webb for the first time in an international against Australia. Wales are set to call a fly-half into their squad to cover Dan Biggar's likely absence from next Saturday's clash with Fiji in Cardiff. 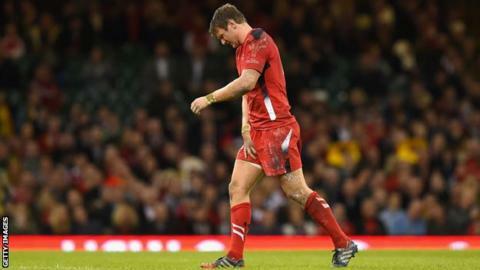 Biggar was replaced by Rhys Priestland in the 33-28 defeat by Australia and has a suspected groin strain. Wales may also be without Toulon full-back Leigh Halfpenny who will be assessed for concussion. "We need to sit down as a group and bring another number 10 in next week," said Wales coach Warren Gatland. "Halfpenny got a bit of a knock so it was precautionary. "Dan Biggar looked like a groin strain, but we don't know how long it is." Ospreys scrum-half Rhys Webb's fitness is also being monitored but is not thought to be too serious. Cardiff Blues' 10 Rhys Patchell has a hamstring injury that rules him out of contention, leaving 76-times capped James Hook, of Gloucester, and Leicester's Owen Williams as candidates for a call-up as fly-half cover. Matthew Morgan, who left Ospreys for England second-tier club Bristol in the summer, has a broken ankle and is out until the New Year. Biggar's Ospreys understudy Sam Davies and Newport Gwent Dragons' Angus O'Brien are aspiring Wales-based fly-halves who could come into contention. New Cardiff recruit Gareth Anscombe arrived on Sunday, 9 November but will not be considered by Gatland for the remaining Tests which also include New Zealand and South Africa. Halfpenny's withdrawal forced a reshuffle that saw Liam Williams move to full-back from wing, George North go from midfield to his more accustomed role out wide and Cory Allen come into the midfield. Wales could have Allen's more experienced national rivals Jonathan Davies and Scott Williams back in contention to face Fiji. Davies was ruled out of the Wallabies clash - which saw Wales slip to their 10th consecutive defeat against the tourists - by a shoulder injury and Williams has a hamstring problem. Gatland said Halfpenny was unlikely to feature against Fiji irrespective of his fitness. "We'll have to see how the next 48 hours goes. He'll have to do a cog [cognitive test] just to see how he goes," the coach added. "But for that, it's probably an opportunity to give him a rest next week anyway and spend some time with the squad and say potentially Liam at full-back next week as well. "I thought we coped pretty well with that injury. I thought Cory Allen came on and again, he hasn't had a lot of rugby, and then moving George to the wing and Liam into full-back, I thought we coped with that change and that upset pretty well."